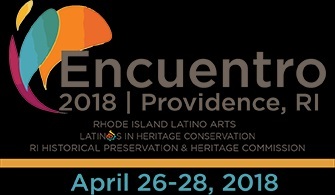 Latinos in Heritage Conservation, Rhode Island Latino Arts, and the Rhode Island Historical Preservation & Heritage Commission are proud to present Encuentro 2018. Spanning three days of programs in Providence and the Blackstone Valley, this groundbreaking event brings together the 3rd National Convening of Latinos in Heritage Conservation and the 33rd Annual Statewide Rhode Island Historic Preservation Conference. Seeds are now available to neighborhood gardeners! The South Providence Library has launched the 2018 Seed Exchange program. 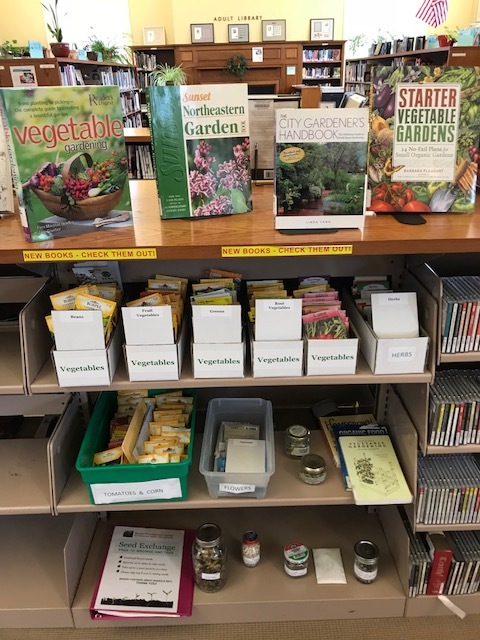 Anyone can come to the library to receive free seeds for a summer garden. A few seeds were contributed by local growers last season, but a large number of seeds have been made available through a free seed program at the University of Rhode Island. This program is made possible annually through the generous donation of seeds by Ocean State Job Lot, and through the efforts of the URI Master Gardener Program volunteers. A backyard garden requires work and commitment throughout the growing season. There can be initial costs that may include a tiller, shovel, rake, hoe and edging material. Going away for a few weeks? You’ll either need to ask someone to watch your garden or risk unhealthy or dying plants when you return. A garden takes away a portion of your lawn or patio. If you already have problems with pain or limited mobility, taking care of your garden can worsen those symptoms. Please visit the library if a garden is in your future this summer. Books are available to help you with your gardening adventure! In response to requests from the community, Providence Community Library is pleased to announce a program to provide help to those who are seeking Citizenship in the United States. The library is pleased to be able to offer an experienced instructor for this program opportunity. Please share information with any neighbors or friends who may be interested. CLASSES are FREE with a $30.00 materials fee. Providence Community Library (PCL) provides the people of Providence with a wealth of knowledge and free learning resources. Our mission is to fight low literacy and lack of opportunity, raise reading scores and help more than 178,000 library users achieve their dreams. Your mission is to ascend to the roof, step over the edge and rappel down the 12-story, 150 feet high Regency Plaza building in Providence. The first 90 individuals to raise a minimum of $1,000 will earn a spot to go Over the Edge for PCL. The valuable funds you raise will take PCL’s services to a new level and will pay for books, computers, exciting makerspace technology, innovative programming, and a whole lot more! 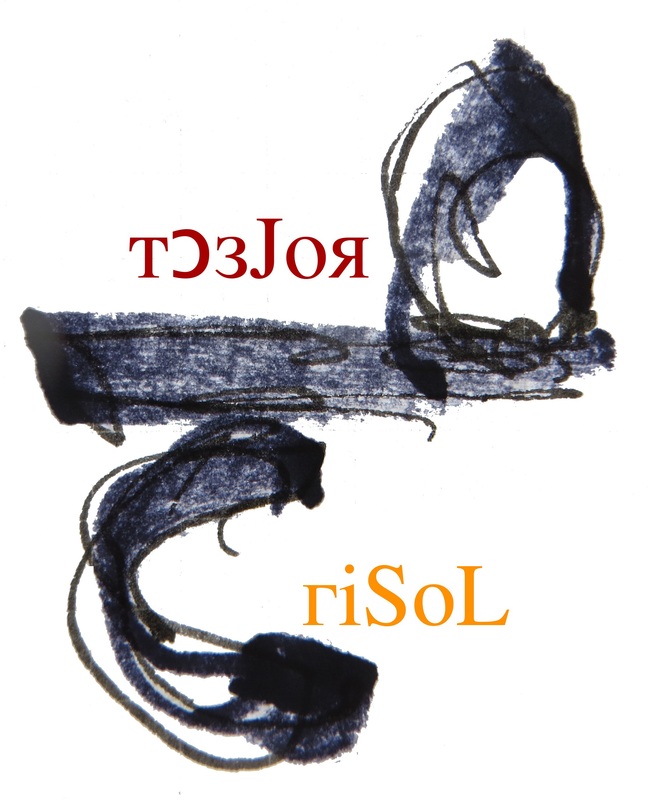 Bilingual Youth Writing Contest and to join the Day of the Children Celebration in April 28.
de sus historias de manera convincente, y en escuchar las historias de los demás con respeto. narrativa juvenil y asistir a la Celebración del Día de los niños el 28 de abril. 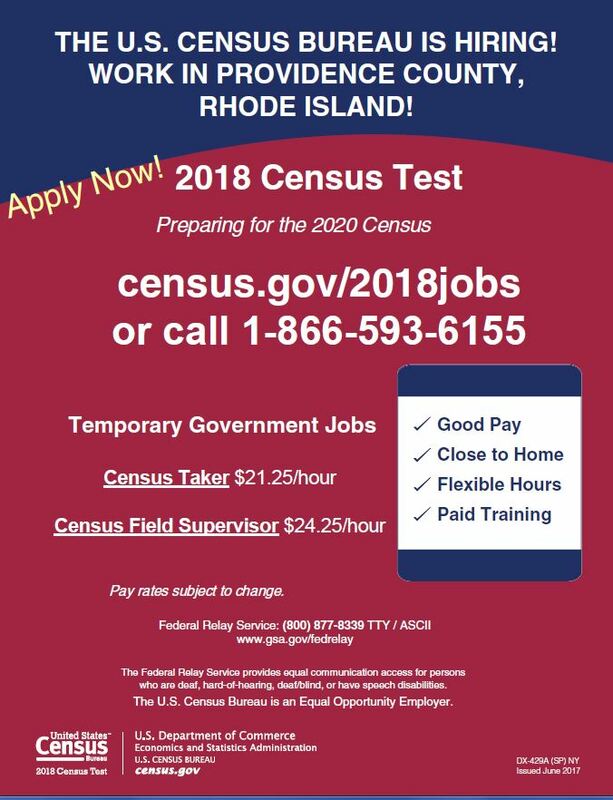 The U.S. Census has begun recruiting for temporary full- and part-time positions in support of the 2018 End-to-End Census Test. The 2018 End-to-End Census Test supports the 2020 Census. The goal of the 2020 Census is to obtain an accurate population count of residents. The 2018 Census End-to-End Test will provide insights to better conduct the 2020 Census and is our planning tool to ensure an accurate census. The Address Canvassing portion, of the 2018 End-to-End Census Test, is taking place in three sites: Bluefield-Beckley-Oak Hill, W.Va.; Providence County, R.I.; and Pierce County, Wash.
2018 End-to-End Census Test jobs available: Providence County, Rhode Island. Please visit https://www.census.gov/2018jobs or call 1-866-593-6155. The Federal Relay Service provides equal communication access for persons who are deaf, hard-of-hearing, deaf/blind, or have speech disabilities. An accurate Census is Vital to Rhode Island. The state is at risk of losing one of only two congressional seats, and federal dollars coming to Rhode Island depend on an accurate count. 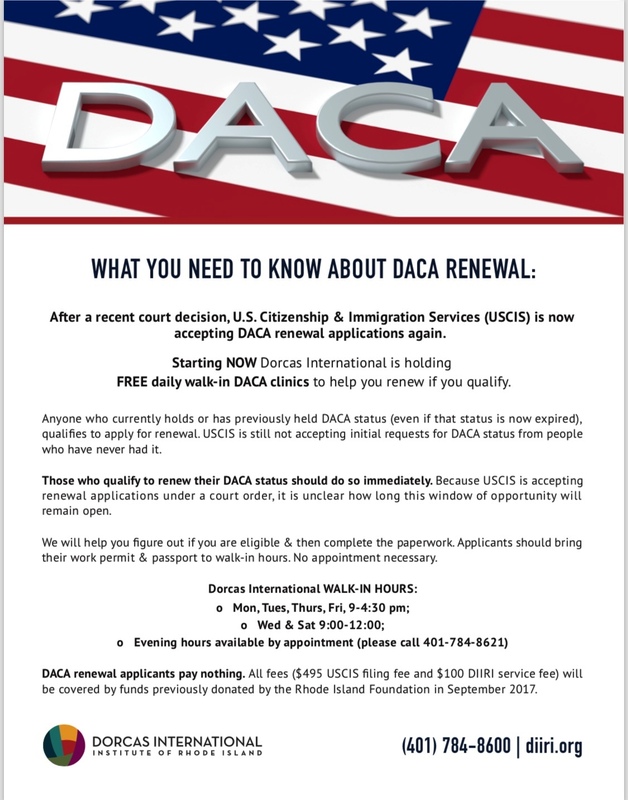 It is important that all residents of Rhode Island be counted regardless of legal status. Census information is not available to other government agencies. Look to Providence Community Library for help with the Census. In April 2018, census surveys may be completed at Providence Community Library Locations. 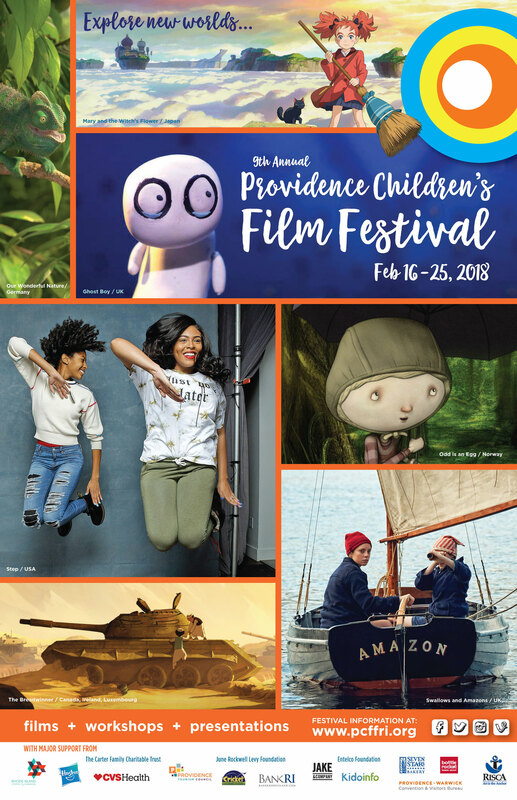 The 9th annual Providence Children’s Film Festival takes place February 16-25, 2018 with screenings, filmmaking workshops, and free activities, along with post-film conversations that help deepen the film-watching experience. Audiences of all ages will enjoy over 100 feature-length and short films—including live-action, documentary, and animation—made by filmmakers from around the world. PCFF’s mission is to present the best of independent and international children’s cinema to inspire, delight, educate, and connect a diverse community of children and families from Rhode Island and beyond. Events take place at main venues within walking distance of downtown Providence and at satellite venues across the state. Bring your characters and their stories to life through animation! This short workshop gives kids an opportunity to create and learn about animation using storyboards to plan it and stop motion techniques to film it! Kids, 7th-12 grade, what are you doing this summer?